Itâ€™s time for tax planning and working on amended extended and late income tax returns. Updated book on employee stock options to be released this month. The tax planning environment is cloudy. Does your child or grandchild have a summer job? Consider gifts to a Roth. Offshore dependents must be U.S. citizens for exemptions. Business travel expenses disallowed for mileage to temporary work sites. Wrongful termination payment for depression was taxable income. Late discovered will saves stock from inclusion in a decedentâ€™s estates. Is your business generating income in more than one state? California takes severe collection action. Delays in processing California statements of information causes problems. More internet retailers are required to collect California use tax. 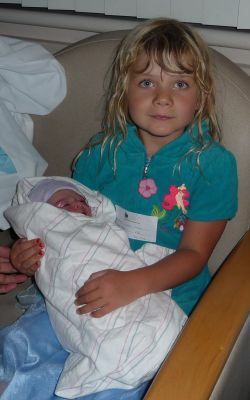 Kara Siemer holds her new baby sister, Minerva, my fourth grandchild. Minerva Siemer was born about 8:14 p.m. on August 1, 2012. She weighed about six pounds, 9 ounces and was 20 inches long. She is a beautiful baby girl with dark, curly hair. Minerva is the second child for her parents, my daughter Dawn and her husband John Siemer. She is the fourth grandchild for my wife, Janet and me. We are thrilled! It seems we were just celebrating graduations and summer vacations, and itâ€™s already time for school to start in most of our local school districts. Be careful when driving for children who arenâ€™t as alert for traffic as they should be. Maybe the British opening ceremonies werenâ€™t as flashy as the Chinese ones four years back, but itâ€™s great that so many countries sent athletes who walked together in peace. So many great smiling faces of young (and not so young) people who were excited just to participate in the Games. The Olympic Games are a great, inspirational event. Enjoy! Theyâ€™ll be over before we know it. Janet and I are celebrating our forty-first anniversary this month. We are grateful for our blessings and still being together. My sister-in-law, Gail Johnston, is celebrating her birthday this month. Happy birthday, Gail! Employee Stock Options â€“ Executive Tax Planning - 2012 Edition by Michael Gray, CPA will be released this month. For the month of August, 2012, you can buy it for half price - $12.49, plus shipping and handling and applicable California sales tax. Click here to print an order form to fax in. The book is 46 pages, and is packed with insights, including an Options Comparison Chart, which employees with options will find invaluable. The Presidential and other elections mean that little is likely to be done relating to expiring tax laws for this year until after the election â€“ probably early in 2013. The alternative minimum tax exemption â€œpatchâ€� adjustment for inflation hasnâ€™t been passed for 2012. Californiaâ€™s recent revelation of â€œside accountsâ€� for various agencies have probably reduced the likelihood that Jerry Brown will be successful in have a tax increase approved by the voters this fall. The increased federal estate tax and generation-skipping tax exemption is an opportunity for many families to make some big gifts during 2012, possibly using a â€œdynasty trustâ€�. There is a risk of â€œclaw backâ€� but even the 35% tax rate for taxable gifts is attractive for 2012. Does your child or grandchild have a summer job? Consider a gift to a Roth. A contribution to a Roth IRA can be made up to the greater of earned income or $5,000. The account grows tax-free, and the earlier a contribution is made, the more of an opportunity for the fund to grow. The $5,000 contribution to a Roth for a child or grandchild would count towards the $13,000 annual gift tax limit. The Tax Court upheld the IRS in denying personal dependent exemption deductions for a U.S. citizen parent living outside the U.S., Canada and Mexico. The taxpayers were a husband and wife living in Israel. The wife was a U.S. citizen. Their six children were all born in Israel. The children later became naturalized U.S. citizens, but they didnâ€™t qualify as dependents for U.S. tax purposes for the years before they became citizens. Non-citizens can qualify as dependents when they are residents of the United States or a country contiguous to the United States. Mr. Saunders was a construction worker, who was an employee of Valley Interior Systems, in Cincinnati, Ohio. During 2007, he temporarily worked at five worksites, which were located 74 to 90 miles from his residence in Manchester, Ohio. The Tax Court upheld the IRS in disallowing $23,121 of unreimbursed employee business expenses, principally relating to business mileage between Mr. Saundersâ€™ residence and the work sites. He did not travel to his employerâ€™s location before traveling to the work sites. The Tax Court said that the work sites werenâ€™t outside of the â€œmetropolitan areaâ€� where the taxpayer lives and normally works. Mr. Saunders said he should be entitled to claim the deductions because the IRS allowed similar expenses for another year. The Tax Court said the IRS isnâ€™t bound to allow a deduction allowed for a previous year. Medicare premiums are deductible as self-employed medical insurance. The IRS has issued Chief Counsel Advice relating to the deductibility of Medicare premiums for partners and S corporation shareholders. All medicare parts may be deducted as self-employed medical insurance, even if the shareholder/partner pays for the premiums and is reimbursed for them. The payment by a partnership is treated as a guaranteed payment and the payment by an S corporation is treated as W-2 income. The deduction is limited to the net income from the partnership or S corporation. The deduction is not allowed for amount paid during a month in which the taxpayer is eligible to participate in any subsidized health plan maintained by an employer of the taxpayer or of the taxpayerâ€™s spouse. Taxpayer who didnâ€™t previously deduct these payments may amend their income tax returns for open years and deduct them. A taxpayer suffered from emotional distress relating to a termination of employment. The employer settled for a $100,000 payment for the emotional distress under a claim of wrongful termination. The taxpayer claimed the damages should be excluded from taxable income as a payment relating to a physical injury. The Tax Court upheld the IRS inclusion of the payment in taxable income. Emotional distress, even with physical symptoms, is not a physical injury qualifying for the exclusion. Mrs. Richard passed away on October 15, 1997. Her will wasnâ€™t submitted for probate until November, 2010. She was a resident of Florida. Mrs. Richardâ€™s husband, Alfred Richard, was deceased in December, 2004. On Alfred Richardâ€™s estate tax return, his executors included 740 shares of class A preferred stock of A.J. Richard & Sons, with a value of $740,000. The IRS asserted a value of $142,203,000 for the shares during August, 2008, based on a control premium. Mrs. Richardâ€™s children (who were also her executors) discovered her will, which would have left her 140 shares of the stock to a bypass trust, not to her husband, and would reduce her husbandâ€™s ownership to a minority interest with no control premium. The IRS said the bequest to the bypass trust should be disregarded and the shares should be included in Alfred Richardâ€™s estate. The Tax Court ruled that, under Florida law, Mrs. Richardâ€™s will was effective to transfer the shares to the bypass trust as of her date of death. The rules for multiple state taxation are very complicated, including when your business is subject to income tax or required to collect sales tax. In California, a business can elect to base its California franchise (income) tax on only a sales factor, or on a three-factor (property, payroll and sales) formula. For service-based businesses with the single (sales) factor formula, income is sourced to the state where the customer benefits from the services. If the three-factor formula is elected, income is sourced where the cost is incurred. Obviously, there can be radically different results under the two elections. You might have heard that internet businesses can be required to collect California sales tax if they have â€œaffiliatesâ€� to whom they pay commissions for referral links to their web sites. The chief target of this rule is Amazon.com. If you are selling goods or services in several states, you really should be discussing these issues with your tax advisor. If you would like to discuss them with Michael Gray, call Michele Brantley at 408-918-3162 on Wednesdays from 8:30 a.m. to 5:30 p.m. to make an appointment. The California State Board of Equalization publishes a list of the top 500 sales and use tax debtors at http://www.boe.ca.gov/cgi-bin/deliq.cgi. Beginning July 1, 2012, those on the list could lose their state-issued licenses, such as driverâ€™s licenses and professional licenses. With staffing reductions, the California Secretary of State is experiencing delays in processing Corporate Statements of Information. Some of the checks sent with the forms have expiration dates, and the forms are being returned because those dates have expired. As an alternative, consider filing your Statement of Information online at https://businessfilings.sos.ca.gov or using a form of payment that doesnâ€™t expire. The California State Board of Equalization has issued proposed 18 Cal. Code Regs. Â§1684, expanding the use tax registration requirements for out of state retailers, including Internet retailers that were not previously required to collect use tax on their sales to California consumers. A controversial provision extends nexus of an affiliate such as a parent company to another member of a controlled group. This is contrary to a Court of Appeals decision in Current Inc. v. State Board of Equalization. A retailer who owns or leases real property or personal property, including a computer server in California, establishes nexus. The retailerâ€™s total Caliofnria sales exceeded $1 million in the same 12-month period. There will probably be challenges to these new rules, but retailers should comply with them until such time, if any, they are overturned. See your tax advisor when establishing procedures to comply with the regulations. August 3, 2012, Judy Barber, Family Money Consultants, LLC, "The transfer of family wealth to the next generation: What's the money for?" August 10, 2012, Judy Barber, Family Money Consultants, LLC, "Raising money-smart kids in the midst of affluence"
August 24, 2012, Gregory Carpenter, BTI Group Merges & Acquisitions, "How to buy a business"
August 31, 2012, Gregory Carpenter, BTI Group Merges & Acquisitions, "Preparing to sell a business"